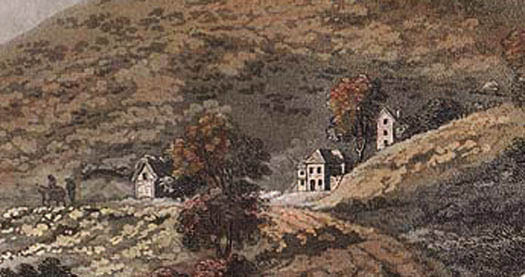 The earliest known picture of a building at the Holy Well (early 19th century) - note the tree to the right of the main building which appears in subsequent pictures. The Eye Well can just be identified on the far right. 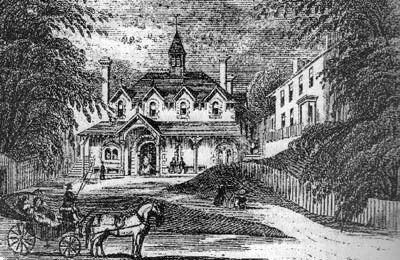 In this picture published by Lane in 1845, the building has had the front porch extended on the left hand side to the full width of the older building. The roof line reflects this possibility. The original building can be seen behind on the right hand side. If the public spout was in the former two storey porch, the new building accommodates this feature through the central doorway with HOLY WELL written above. This would account for the location of the public spout thereafter. 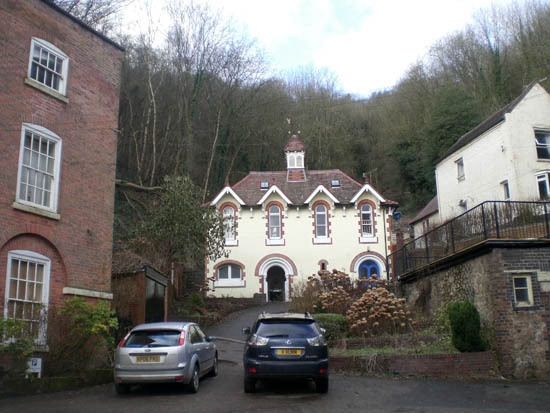 Note the trees either side and steps on the left hand side are consistent with the earlier picture. 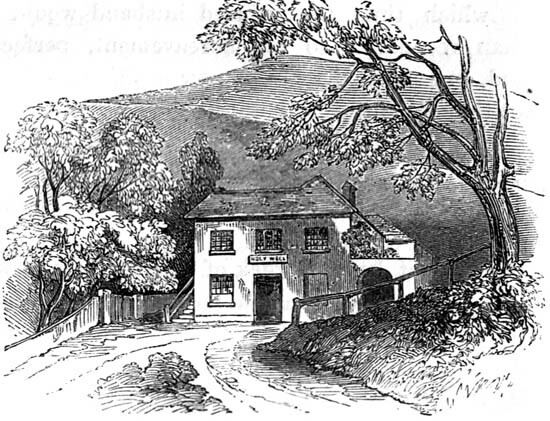 The picture above is thought to date from circa 1850 and is somewhat fanciful, depicting what was then the newly restyled frontage of the Holy Well building. The accoutrements of commercial water bottling are not present and so it may be that it was early days for Schweppes and their bottled Malvern Water production. 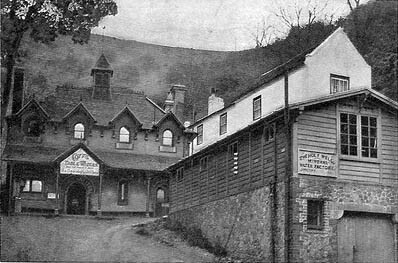 This early photograph shows the Holy Well building after it was extensively restyled in the manner of a Germanic spa for Schweppes to commence bottling in the early 1850s, having first bottled at St Ann's Well for the Geat Exhibition in 1851. 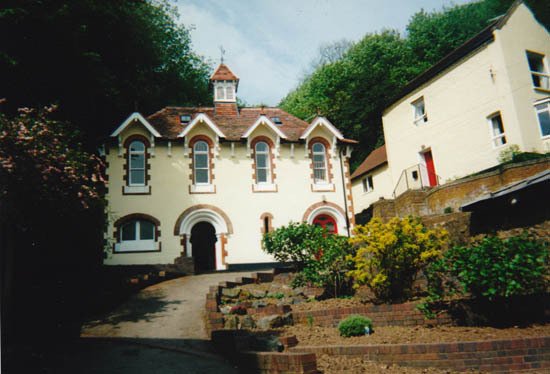 The changes to the building included extending the building on the first floor on the right hand side, re-roofing and adding chimneys and gables and modifying the entrances and window tops with arches. A veranda was also added together with a spire/vent on the roof. The tree on the right remains and that on the left is substantially larger than previous. This slightly later picture than the one above shows in more detail the modifications made at the time of Schweppes starting bottling. A new building has been added in the foreground to the right presumably to act as a store for the water containers that were previously stored outdoors. The tree on the left has been trimmed back and the public spout is visible through the opening on the veranda. This picture taken at the time of Cuffs bottling in the 1920s shows the storage shed in the right foreground as a two storey structure. The tree that grew here has long gone. 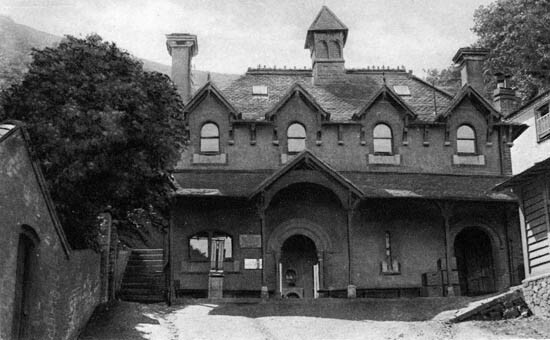 By the 1950s the veranda had been removed and motor vehicles were having to be accommodated. 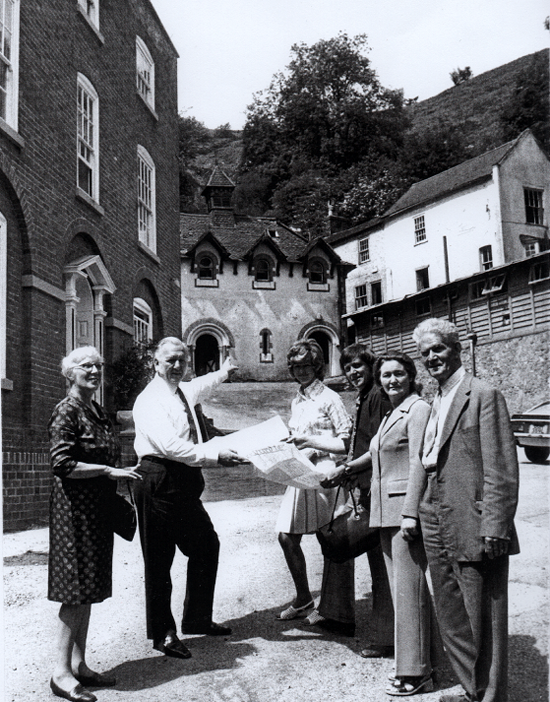 John Parkes took over the premises in 1973 and is seen here showing his new plans to the Friends of Malvern, later the Civic Society. John continued the tradition of bottling as well as restoring the main buildings. 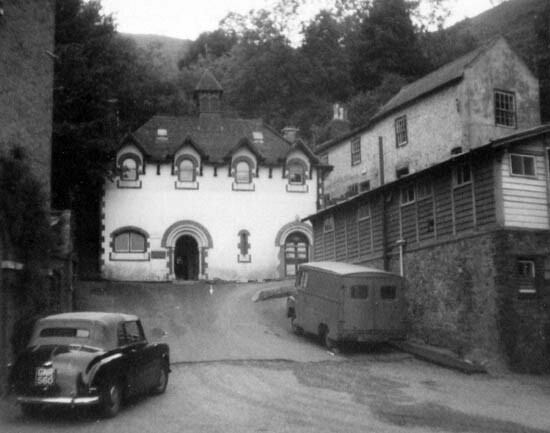 This 20th century picture shows the modifications carried out by John Parkes when he restored the building in the 1970s. The upper storey windows have been extended downwards. The lower level of the storage building to the right remains buried in the ornamental flower beds in the foreground. Parking is accommodated on the forecourt where this picture was taken. The Holy Well and surrounding buildings in 2015. 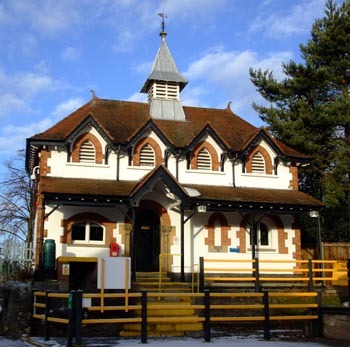 Now the Humm family maintain the bottling business for Malvern Holy Well Water having carried out further maintenance and enhancement of the building. No, this is not the Holy Well building! 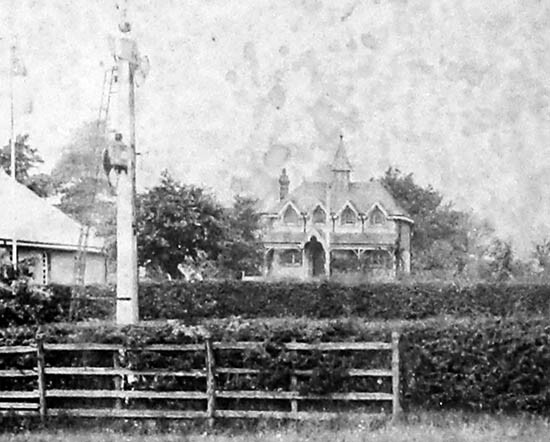 Above is the earliest known picture of the Tank House, a replica of the Holy Well building, taken from across the railway line that serviced the Colwall bottling works. It is thought to date from circa 1910. For a larger view click the picture. No record of the Holy Well building would be complete without a picture of this replica copy at Colwall. 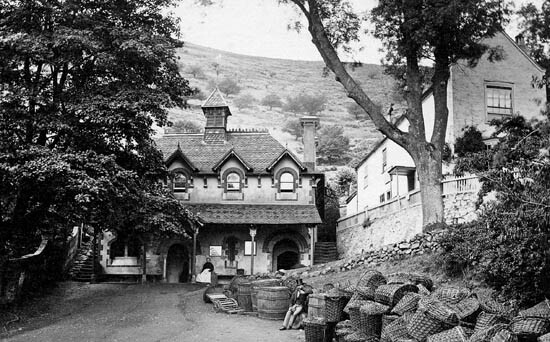 Built by Schweppes in the early 20th century, it is a scaled down version of the real thing on the other side of the Malvern Hills. It was built after Schweppes relocated their Malvern Water production plant to Colwall and enabled them to perpetuate their association with such an iconic edifice. 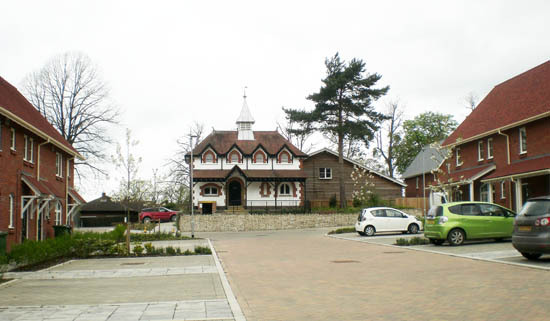 It is now Grade II listed and being incorporated as the centre piece of a new village development following closure of the bottling works in 2010. Below is a vision of the Tank House in the future - an iconic centrepiece of a new village development in Colwall by Blue Cedar Homes. 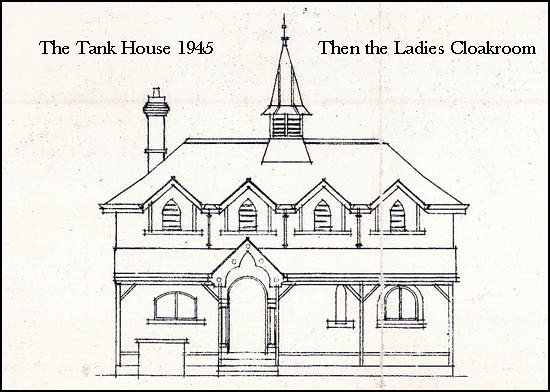 Below is a vision of the Tank House realised in 2017. Now a permanent reminder of the once world famous bottling works that once occupied the site.